I recently had to replace the seal in my Sunbeam EM6910 espresso machine. Actually it’s technically not mine but on a long-term loan. 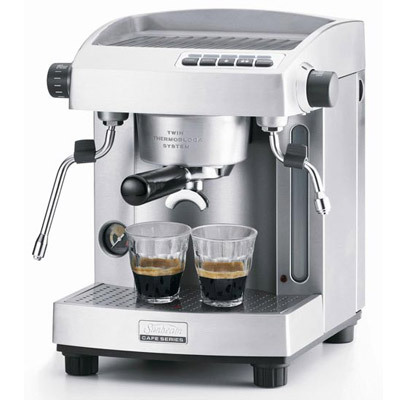 For a budget machine it’s quite capable and I like the fact you get ‘big’ features like a full-size, non-pressurised portafilter. While I guess I can tolerate that as an annual maintenance cost (do even I get a choice?) what really floored me was the cost of the seal. $41 for a small rubber ring! A genuine replacement seal for a bottom-end, pressurised portafilter machine from the same supplier is only $9, and as an even better example, a seal for a high-end commercial Wega machine from Caffe L’affare is only $7! Even worse is that this is the third seal this machine has been through in two years, and a quick Google search reveals I’m not the only person to notice. My previous el cheapo Sunbeam machine managed four years of abuse service without me having to do anything other than clean it. Since when was a $300 machine supposed to be more reliable than a $1000 one? I actually felt like the engineers at Sunbeam had put some effort into this machine, so why this? I just hope they take some time to research their own product. Sorry, it went back to its owner a few years ago. I’ve moved onto a Nuova Simonelli Oscar now but don’t have any plans for modding it at this stage.